Create a stunning and unique look in your home with these beautiful silk cushions personalised with your own photos. Featuring a stylish rope braid trim in three colours and filled with either plump feather or poly padding, they're the perfect cuddle companion. 100% real silk cushions are UK handmade and are the epitome of elegance. Handmade to order in London, your bespoke silk cushions will make a stylish statement in any home. Custom printed with your photos for a special touch and made from 100% real silk, they effortlessly enhance the decor whilst bringing a smile to everyone's faces. Measuring 16" sq, these large, plump and sumptuous cushions can be used an extra pillow or scattered on the sofa for contemporary presentation. Finished with a rope braid trim in your choice of 3 colours, the professional print quality and elegant look and feel make this a stunning gift and unforgettable gift for loved ones. Excellent customer service, friendly team, quick delivery and beautifully manufactured product! Really impressed with everything! I'd been dying to get Mum something extra special for Christmas and as soon as I saw one of theses silk cushions I immediately thought "just the ticket". Despite a slight hiccup with the order in which I firstly revived just the cover and not the down pad, I was able to contact Bags Of Love via their chat service who responded immediately and were able to rectify the problem, and now the silk cushion is sitting quite nicely at home on our sofa. The cover was a little creased, and the insertion of the pad did prove to be quite difficult, but I managed and the creases are barely noticeable. The photos are of very good quality with the wine red braid adding that extra little touch of elegance, and the feather down filling giving that all the more natural as well as plump and soft feel. Fast delivery to Switzerland. Exactly as pictured. Happy with purchase. Good quality and a very good seller. Thank you. Will order again. Like many of our products, your silk cushions have a quantity discount, so when you buy two or more, the price per cushion is cheaper. This is perfect if you're looking to create a set of scatter cushions for your home or a gift set for a loved one. Click start design above and print your fabulous memories onto luxury silk cushions for a timeless gift. Our expert seamstresses hand make your luxury cushions with love, care and attention. Each one is totally unique and an example of fine craftsmanship. Using a specialist printing process that locks the ink deep into the silk fibres, we can guarantee that your designs won't peel over time. We fill your cushions with either feather and down or poly padding, both equally plump and comfortable. Finished with an elegant rope braid trim in your choice of three colours (red wine, honey gold or ivory) the result is beautifully striking luxury silk cushions. Care: As with all real silk products, we recommend specialist dry cleaning your cushions only. This delicate fabric needs to be treated with care to ensure its long life. Single photos, photo montages and patterns look amazing printed onto 100% real silk. As this is a 100% natural fabric, no chemicals have been used in the fibres and you will get rich, intense colours due to our specialist printing method. Silk is a traditional 12th-anniversary material so design a cushion made from real silk for your husband or wife. Print your wedding photo on one side and a loving message on the other, so every time you're cuddling on the sofa you can be reminded of your most important day. Decorating the house at Christmas doesn't have to be limited to the tree and a few lights up the bannister. These gorgeous silk cushions would look stunning printed with a photo from the festive period, or for a more artsy approach, why not print the lyrics to your favourite Christmas song? Guests & family will love the attention to detail. 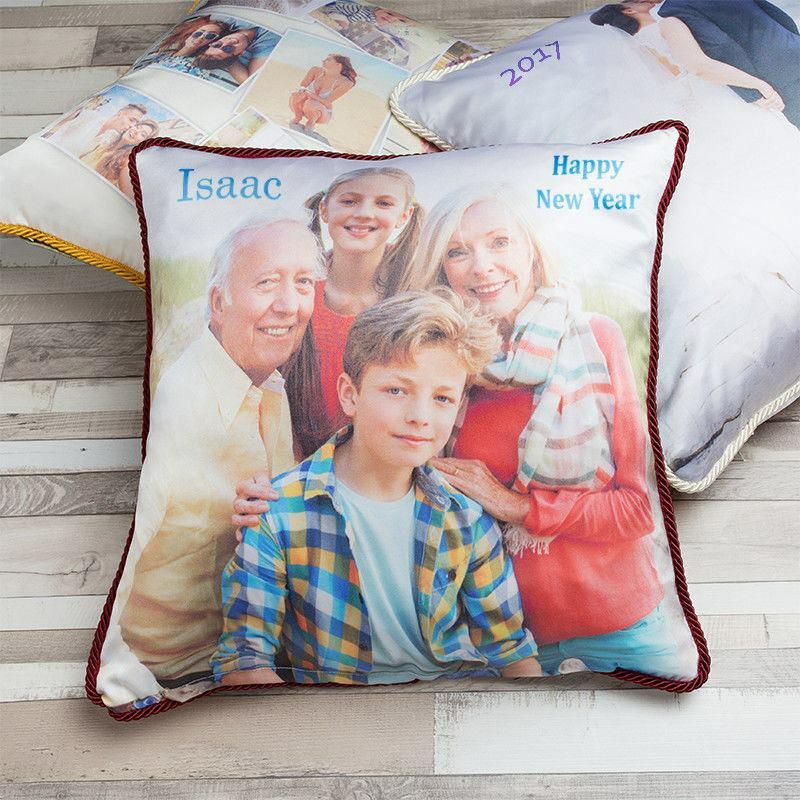 Imagine how excited your grandparents would be to receive a personalised silk cushion featuring photos old and new. The rope braid trim adds a touch of traditional style, something sure to be appreciated by Nan or Granddad. You could always add a special message to celebrate the occasion.